Alex Gibney’s ZERO DAYS is a documentary thriller about the world of cyberwar. For the first time, the film tells the complete story of Stuxnet, a piece of self-replicating computer malware (known as a “worm” for its ability to burrow from computer to computer on its own) that the U.S. and Israel unleashed to destroy a key part of an Iranian nuclear facility, and which ultimately spread beyond its intended target. ZERO DAYS is the most comprehensive accounting to date of how a clandestine mission hatched by two allies with clashing agendas opened forever the Pandora’s Box of cyberwarfare. 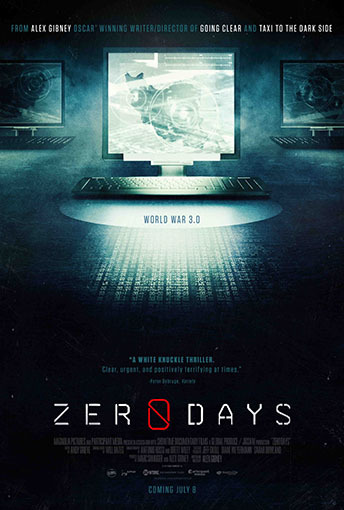 Beyond the technical aspects of the story, ZERO DAYS reveals a web of intrigue involving the CIA, the US Military's new cyber command, Israel's Mossad and Operations that include both espionage and covert assassinations but also a new generation of cyberweapons whose destructive power is matched only by Nuclear War.